This note is updated at my new blog space only, blog note http://www.teigfam.net/oyvind/home/technology/050-sound-on-sound-and-picture/. Welcome there! Updated 27Sept2012 (after iOS 6 update to AppleTV), chapter "Playing from and to different devices"
This was bought at Hi-Fi klubben here in Trondheim in July 2011. Bringing it home, the first non-power cable I connected was the home network's ethernet cable. Joy! The only cables I plugged out from the 20 years old Denon Precision Audio Component / AM-FM Stereo Receiver DRA-335R were analogue. It has been tired some years now, together with the Denon PCM Audio Technology / Compact Disc Player DCD-680. Both were also bought at HiFiKlubben back then, and will now be stacked on the loft. Hard to scrap a friend. The Ceol took charge and asked me if I wanted to update its firmware. Yes, I did - and it did the job in some 30 minutes. I had bought the thing for its AirPlay capability (there are plenty other nice boxes without), and went to http://www.denon.eu/airplay/en/. First I had to pick out our unit's serial number, MAC address and upgrade ID. Paying with PayPal has always been a pleasure, so I expected the Ceol to be my everything's remote speaker any minute. For 48€ I thought it should. It didn't. Even if I got a receipt that all was fine - and in the background: Apple had got their licence fee. Since I get a salary every month I don't protest if others want some, even if they put it in the bank. The Ceol told me I could upgrade with AirPort, ok. I pushed the right menu entries, and it said Authenticating for a minute, an hour, a night. All it accepts then is a power off, so I retried. Nope. A letter to HiFiKlubben and a reply from support adviced me to restart to factory settings. The updated firmware and the 48€ investment should be fine. In the manual it's called "Resetting the microprocessor: unplug the power cord, then hold volume up and down simultaneously and plug in the cable, then release the buttons". However, I used the slightly different procedure in the support email: "Total reset (to factory settings out of the box / virgin mode) 1. Switch Off the unit and unplug mains plug from wall outlet. 2. Press and hold both Volume up and Cursor down buttons on the front panel and plug the mains plug into the wall outlet. 3. Release the two buttons." This worked perfectly (as probably would have the manual's recipe? ): AirPlay soon was in the box. And everywhere! Running Apple's Remote app on the iPad now, the iTunes library comes up as usual, but both the Ceol and the computer come up! I get "surround sound" that I did't know. The tv speakers with nice bass sound (from JackOSX router on the Mac Mini, see blog 019) also appeared. And they are in phase (thanks to some clock synchronization messages in the AirPlay protocol I believe). Now Gary Moore's Ballads & Blues 1982-1994 plays like music has never been heard in this house. At the moment: bliss. I still haven't figured out why it comes on with an enormous volume some times. So, if the amp is more powerful than the speakers, the AirPlay start-up volume may destroy your speakers! For me, it's ok, though. The app volume control and the real volume may be out of synch before I have touch the app's volume control. So, when I try to push the volume down (from a shown high volume), it increases (from the unit's low volume) - so that the overall effect is increased volume! Aften that up is up and down is down. Some times one of the AirPlay "speakers" fall out, and I'd have to manually reconnect. One time, while iTunes (version 10.4) converted a bunch of songs to mp3 (and was very busy in one of its "threads"), and it was playing a song simultaneously - the speakers went out of synch. I know this, since it was easy to hear. I would guess 50 ms since it was not that much. "Connecting to AirPlay unit" when envisaged as already connected. Every time I find a new melody it seems to disconnect and then needs some extra time to reconnect. I experience this as not necessary. I have seen Denon not display the present melody, when I played iTunes through the Remote app. Didn't iTunes send it, or didn't Denon update? It stayed with the other day's melody through a whole playing session. At the moment I dont't know what updates it. Reported to http://www.apple.com/feedback/itunesapp.html. I have found no similar feedback link to Denon. We finally (in July 2012) bought an Apple TV unit. This chapter does not discuss the Apple TV per se, but how AirPlay works . The figure above does not show all details, and I have done some shortcuts. Have a look at note 019 for more details (but not updated with Apple TV). I am most concerned with when the sound is synchronized (playing without relative delays between individual units) in this note. Mirroring the screen is only possible to one screen, I assume. Anyhow, I can listen to sound from many speakers (connected to several amplifiers) but only want to see one screen at a time. The iPad and iPhone (as well as OSX Mountain Lion, which I don't have) can mirror the screen over AirPlay. That is just so nice. Is the unwanted delay caused by the HDMI? The screen is a Samsung RE26E0 TV (from 2005-06). The unwanted delays I am describing here may have to do with the internal D/A-conversion delay for the HDMI cable. But then, shouldn't that also have given reckognisable delay for the HDMI from the TV tuner? See discussion thread "AirPlay audio sync issue" here (thanks, Anders!). That thread also mentions that AirPlay has a buffer delay of 2 seconds, so there should be no delays between the immediate outputs from any AirPlay unit. If I only had an optical input D/A converter to test the Apple TV's direct output. I also set "PC Delay" from "41H" to "00H"
Then the delay through the HDMI port was zero! AirPlay has always been working! Since I don't use the optical sound output from the Apple TV, the TV has to be on to get the sound to any speakers from the Apple TV. This is no problem, we need its screen anyhow. New with iOS 6 upgrade on AppleTV (late Sept. 2012): Now it is possible to send AirPlay music to the other AirPlay units! It's also possible to adjust the volume with the AppleTV remote control on the AppleTV. Observe the difference between playing from Apple TV and playing with Apple TV. More below. As I mentioned in the topmost chapter, playing from the Mac Mini (with iTunes) into the blue speakers (center) and the black Denon speakers (right) are completely synchronous. The Mini runs Lion, not Mountain Lion. The latter can mirror its screen to the Apple TV. Our Mini is too old for that. If the following happens to you then try to check the HDMI delay, see above, to see if you can get rid of it. (I try to leave traces of the path to a solution in my blogs, and this is a paragraph "on the road":) "However, adding the Apple TV as the third speaker is not useful, since there is a reckognisable delay. It's not at all in synch! 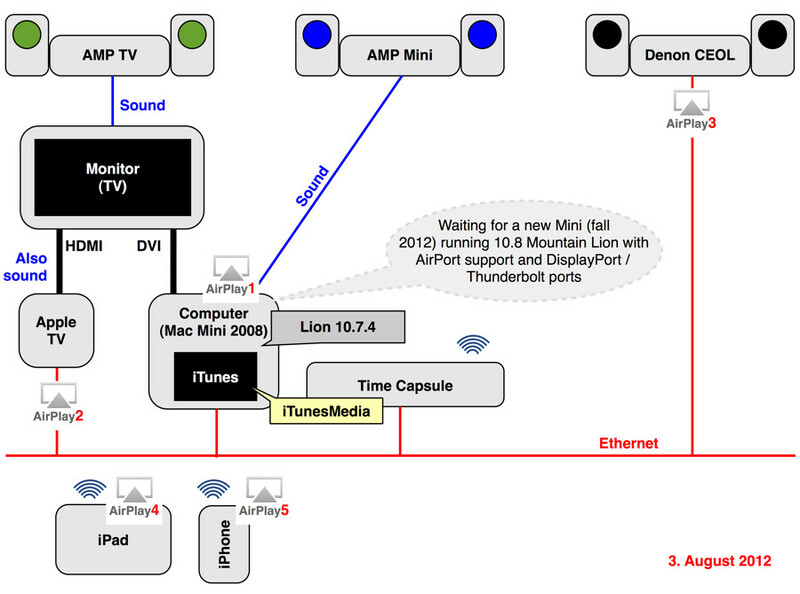 Routing the sound to Apple TV in this case does not make sense." When selecting AirPlay units from iPad or iPhone, the Mini output (blue, center) does not appear. This is easy to understand, since Lion is not a first class citizen of AirPlay. When I run iTunes on the Mini, however, "This computer" appears as a selection - in addition to the other two. Tanks for this post. I had the same problem with "authenticating" message during the upgrade. You saved me hours of searching and contacting the support. Nice job!